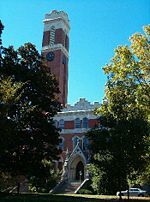 Vanderbilt University is a private, nonsectarian, coeducational research university in Nashville, Tennessee, in the United States. Founded in 1873, the university is named for shipping and rail magnate "Commodore" Cornelius Vanderbilt, who provided Vanderbilt its initial $1 million endowment in the hopes of making a contribution to the struggling society of the Post-Civil War South. Initially affiliated with Methodist Episcopal Church which regarded the University as an opportunity to unify their educational program and consolidate their presence in the Southern United States, following a power struggle the Methodists severed their ties with Vanderbilt. In its history Vanderbilt has been involved in controversy surrounding issues of racial segregation. During the early days of the American Civil Rights Movement James Lawson was expelled for his activities. In later years the University changed its position, hiring him on the faculty. Vanderbilt also pioneered the inclusion of African Americans in sport, fielding the first black basketball player in the Southeastern Conference. Today, Vanderbilt strives for scholarly excellence and freedom of inquiry, as well as diversity in its student body. It comprises four undergraduate and six graduate schools, and enrolls a large number of students from all 50 U.S. states and many foreign countries. Beyond its academic and professional programs, the university is known for its research programs and institutes, through which it strives to contribute to the larger community. Vanderbilt states its mission as centering around "scholarly research, informed and creative teaching, and service to the community and society at large." Its dedication to "intellectual freedom that supports open inquiry" and "equality, compassion, and excellence in all endeavors" are the means by which it actively pursues its mission. Vanderbilt University has a long held reputation for excellence, both in its teaching and research. It offers a "combination of cutting-edge research, liberal arts and a distinguished medical center" and nurtures an atmosphere where students in academic and professional fields can meet their educational goals while researchers are supported in collaborative efforts to "solve complex questions affecting our health, culture and society." 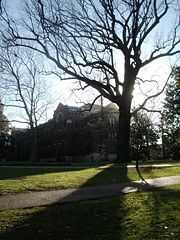 Vanderbilt was ranked 17th in national universities in the 2011 edition of Best Colleges by U.S. News & World Report. In the same publication's graduate program rankings, Peabody College of Education and Human Development was listed first among schools of education, and the schools of law and medicine were ranked among the top 20 in the country. The Times Higher Education World University Rankings published by Times Higher Education (THE) ranked Vanderbilt as 51st in the world in 2010. The University is named after Cornelius Vanderbilt, a wealthy, northern industrialist who made the initial donation of $1,000,000 to the Methodist Episcopal Church so as to "contribute to strengthening the ties which should exist between all sections of our common country." The donation was made to Bishop Holland N. McTyeire who was related to Vanderbilt through marriage and had spent time recovering in the Vanderbilt mansion following medical treatment in 1873. Vanderbilt had been considering philanthropic causes as he was at an advanced age. After successfully convincing Vanderbilt of the importance of a central Southern University, McTyeire returned to the governing body of the Methodist Episcopal Church with enough money to start the university. From its inception, Vanderbilt focused on two educational goals: It offered work in the liberal arts and sciences beyond the baccalaureate degree and it included several professional schools. In the fall of 1875, 307 students enrolled at Vanderbilt; the university was dedicated in October of that year. The student enrollment doubled itself each 25 years during the first century of the it's history: From 307 in the fall of 1875; 754 in 1900; 1,377 in 1925; 3,529 in 1950; to 7,034 in 1975, it reached over 10,000 by the end of the twentieth century. The main building after reconstruction, renamed Kirkland Hall. James H. Kirkland, the longest serving chancellor in university history (1893-1937) guided Vanderbilt to rebuild after a fire in 1905 that destroyed the main building, which was renamed in Kirkland's honor. He also navigated the university through the separation from the Methodist Church. 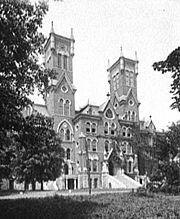 Old Main (1875), photographed before it burned in 1905. For the first 40 years, the Board of Trust (and therefore the university itself) was under the control of the General Conference (the governing body) of the Methodist Episcopal Church, South. However, tensions rose between the university administration and the Conference over the future of the school, particularly over the methods by which members of the Vanderbilt Board of Trust would be chosen and the extent to which non-Methodists could teach at the school. Starting in the early years of the twentieth century, a power struggle between the Bishops and the non-clergy members of the Board began, culminating in a vote to limit the power of the Bishops in the administration of the school. The Methodist Church took the issue to court and won at the local level; however, on March 21, 1914, the Tennessee Supreme Court ruled that the Commodore, and not the Methodist Church, was the university's founder and that the board could therefore seat whomever it wished. 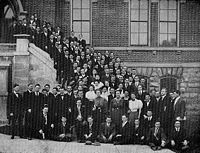 The General Conference in 1914 voted 151 to 140 to sever its ties with Vanderbilt; it also voted to establish a new university, Southern Methodist University, and to greatly expand Emory University. Vanderbilt University enjoyed early intellectual influence during the 1920s and 1930s when it hosted two partly overlapping groups of scholars who had a large impact on American thought and letters: The Fugitives and the Agrarians. During the same period, Ernest William Goodpasture and his colleagues in the School of Medicine invented methods for cultivating viruses and rickettsiae in fertilized chicken eggs. This work made possible the production of vaccines against chicken pox, smallpox, yellow fever, typhus, Rocky mountain spotted fever, and other diseases caused by agents that propagate only in living cells. These innovations helped to propel Vanderbilt's reputation as a research institution to equal some of the older and more prestigious U.S. schools at the time. In the late 1950s, the Vanderbilt Divinity School became involved in the emerging American civil rights movement. A prominent leader and colleague of Dr. Martin Luther King, Jr., James Lawson enrolled at the university's Divinity School. There he conducted nonviolence training workshops for the Southern Christian Leadership Conference and launched the Nashville sit-ins to challenge racial segregation in downtown stores. Along with activists from Atlanta, Georgia, and elsewhere in the South, they formed the Student Nonviolent Coordinating Committee (SNCC) in April 1960. SNCC and Lawson's students played a leading role in the Open Theater Movement, the Freedom Rides, the 1963 March on Washington, Mississippi Freedom Summer, the Birmingham Children's Crusade, the Selma Voting Rights Movement, and the Chicago Open Housing Movement, activities which resulted in Lawson's expulsion from the school. Much later, in 2005, Lawson was named a Distinguished Alumnus for his achievements and re-hired as a Distinguished University Professor for the 2006–2007 academic year. 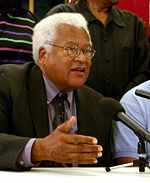 James Lawson speaking at a community meeting in Nashville, Tennessee in 2005. Some years later, the university drew national attention once again; this time for an act of inclusion. In 1966, the university recruited the first African American athlete in the Southeastern Conference (SEC), Perry Wallace. Wallace, from Nashville, played varsity basketball for Vanderbilt from 1967-1970, and faced considerable opposition from segregationists when playing at other SEC venues. Over the years, he received numerous awards for his efforts in integrating the SEC. A statue of him in front of Buttrick Hall memorializes his efforts. From the mid-twentieth century onward, Vanderbilt University expanded, with the addition of new colleges, such as the Owen Graduate School of Management and the acquisition of Peabody College. Research and facilities also greatly improved and were continuously upgraded as Vanderbilt's reputation for excellence in the area of research became more widely recognized. Beginning in 1981, under the leadership of Roscoe Robinson, the Medical Center rose in importance to become the nation's best. When Robinson retired in 1997, Vanderbilt University Medical Center had become a billion-dollar enterprise, with the best overall patient care facility in the region, and a reputation for world-class research. During the chancellorship of Joe B. Wyatt, from 1982 until 2000, great emphasis was placed on improving the quality of faculty and instruction. Wyatt oversaw a substantial increase in the university's endowment, greater student diversity, and the renovation of many campus buildings. The Wyatt Center on Peabody's campus is named for Wyatt and his wife. During Wyatt's tenure Vanderbilt rose to the top 25 in the U.S. News & World Report's annual rankings for the first time. The Vanderbilt campus is located approximately 1.5 miles (2.4 km) southwest of downtown in the West End neighborhood of midtown Nashville. It has an area of 330 acres (1.3 km²), though this figure includes large tracts of sparsely used land in the southwest part of the main campus, as well as the Medical Center. The historical core of campus encompasses approximately 30 acres (0.1 km²). The oldest part of the Vanderbilt campus is known for its abundance of trees and green space, which stand in contrast to the surrounding cityscape of urban Nashville. 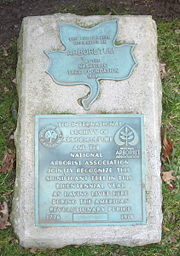 The campus was designated as a national arboretum in 1988 by the Association of Botanical Gardens and Arboreta. Every tree indigenous to the state of Tennessee can be found on the campus. The oak tree between Garland Hall and Rand Dining Facility is known as the Bicentennial Oak, as it predates the American Revolution. In the northeast corner of the campus is the original campus, which has many historic buildings that date back to the establishment of the university. To the south are the more modern additions, including many of the science and medical facilities. Directly across from the Medical Center sits the campus of the Peabody College of Education and Human Development. The campus is home not only to Peabody College but also to The Commons, where all freshmen live together as part of the College Halls plan. The Commons, located on the Peabody campus, is part of the new College Halls system at Vanderbilt. Due to their separate histories until the merger, the Peabody campus was configured in a radically different style than the original Vanderbilt campus. Whereas the latter has an unplanned organic design with buildings scattered throughout, Peabody campus was planned as a geometric design, similar to the Jeffersonian style of the University of Virginia. The Jean and Alexander Heard Library is the University's main library. Originally established in 1873, the library suffered a fire that destroyed most of the collection. It took many years to rebuild the collection to where it stands today at approximately two million. The Library also houses several unique collections, such as the Television News Archive, the University Memorabilia Room, Photograph Archives, and a selection of specialty manuscripts. Vanderbilt University has several athletic and health related facilities. College basketball teams play in the the Memorial Gymnasium, which has a seating capacity of over 14,000. Vanderbilt Stadium is where football is played, a stadium built in 1981 with a seating capacity of almost 40,000. Other facilities include Hawkins Field for baseball, the Vanderbilt Track, a soccer and lacrosse field, the Brownlee O. Currey Jr. Tennis Center, and the John Rich Complex for athletic training. The Vanderbilt Legends Club of Tennessee is a 36 hole golf course that is located off campus. The university also has several exercise and health centers for students, most of which are located in the Student Recreation Center. Vanderbilt University offers Bachelor's (undergraduate), Master's (graduate), and Doctorate/PhD (post-graduate). The College of Arts and Sciences offers both classic and more modern variants of the Liberal Arts and Sciences majors, including African American and Diaspora Studies, Ancient Ancient Mediterranean Studies Studies, Anthropology, Art Studio, Biological Sciences, Chemistry, Ecology, Evolution, and Organismal Biology, Economics, English, Film Studies, Mathematics, Neuroscience, Psychology, and Women’s and Gender Studies. The Blair School of Music offers four undergraduate degrees: Musical performance, composition/theory, musical arts, and musical education. The school of engineering offers several variety of undergraduate degrees, including Biomedical Engineering, Chemical Engineering, Civil Engineering, Computer Engineering, Electrical Engineering, and Mechanical Engineering. The school offers graduate and post-graduate degrees in general engineering science. The Divinity School offers Master's and Doctorate degrees in Theological Studies, Ethics and Society, Hebrew Bible and Ancient Israel, Historical Studies, History and Critical, Theories of Religion, Homiletics and Liturgics, Jewish Studies, New Testament and Early Christianity and Religion, Psychology, and Culture. The Law school offers the Master's level Jurispuridence degree as well as a PhD in Law and Economics. The Owen Graduate School of Management offers the general Master of Business Administration, Finance and Accountancy. The School of Medicine offers a Medical degree as well as health-related but non-medical degrees such as Biomedical Informatics, Chemical and Physical Biology Program, Hearing and Speech Sciences, and Interdisciplinary Graduate Program in the Biological Sciences. The School of Nursing offers both a Master's and PhD in Nursing. The Wyatt Center on the Peabody campus. The Vanderbilt Medical Center is a vital component of the university and is the only Level I Trauma Center in Middle Tennessee. All undergraduate students not living with relatives in Davidson County are required to live on campus all four years to the extent that on-campus student housing facilities can accommodate them. In practice, approximately 83 percent of undergraduates—freshmen, sophomores, nearly all juniors, and most seniors—currently live on campus. The remaining undergraduates join graduate and professional students in living off-campus. Student life at Vanderbilt is consequently heavily intertwined with campus life. The university recognizes nearly 400 student organizations, ranging from academic societies to recreational sports clubs, the oldest of which is the Vanderbilt Sailing Club. There are also more than 30 service organizations on campus, giving students the opportunity to perform community service across the country and around the world. Vanderbilt Student Communications, Inc., (VSC) owns eight print publications, a broadcast radio station, and a closed-circuit television station. One publication, The Vanderbilt Hustler, was established in 1888 and is the oldest continuously published newspaper in Nashville (the newspaper's name references another nickname for the Commodore based on his business practices, namely that he "hustled" people out of their money). The on-campus radio station, WRVU, represents the student body by playing a range of music from bluegrass to choral, with a focus on non-mainstream music, while the campus television station, Vanderbilt Television (VTV), showcases student-produced films, skits, and news and entertainment-based shows. Additional student publications include those published by the Vanderbilt University Law School, which publishes three law reviews; the flagship journal is the Vanderbilt Law Review. Greeks are an active part of the social scene on and off campus, and the university is home to 21 fraternities and 14 sororities. Vanderbilt is a charter member of the Southeastern Conference and is the conference's only private school. With fewer than 6,600 undergraduates, the school is also the smallest in the conference. Vanderbilt therefore fields fewer teams than any of its rivals—only 16—and sometimes lacks the national prominence enjoyed by schools such as the University of Florida or the University of Kentucky. The school is a member of the American Lacrosse Conference for women's lacrosse, as the SEC does not sponsor that sport. Conversely, Vanderbilt is the only league school not to field teams in softball and volleyball. Men's and women's tennis and men's and women's basketball are traditionally Vanderbilt's strongest sports, with the more recently founded women's lacrosse and bowling programs as well as the long-standing men's baseball program experiencing moderate national success. Vanderbilt's intercollegiate athletics teams are nicknamed the Commodores, in honor of the nickname given to Cornelius Vanderbilt, who made his fortune in shipping. The term "commodore" was used by the Navy during the mid- to late-nineteenth century, a commodore being the commanding officer of a task force of ships, and therefore higher in rank than a captain but lower in rank than an admiral. Since the term was used most during the nineteenth century, Vanderbilt's mascot is usually portrayed as a naval officer named "Mr. Commodore," or just "Mr. C," dressed in the style of the late 1800s, complete with sideburns, cutlass, and uniform. Students and alumni refer to Vanderbilt athletic teams as the "Dores" and use the cheer "Go Dores!" Vanderbilt has many traditions. The one taken most seriously is the Code of Honor. As a part of their first act together as a class, each entering class meets together at the Honor Code Signing Ceremony, where every member of the class pledges their honor and signs the code. The signature pages are then hung in Sarratt Student Center. The ceremony is one of only two occasions where a class will be congregated in a single place at the same time (the other being Commencement). Commodre Quake is an annual concert held in the Memorial Gym that starts homecoming week. Rites of Spring is another musical event, a festival held right before finals that has brought such famous bands and performers as Dave Matthews Band and Nelly. The University has a special hand sign to indicate a V and U for the school's initials: Extend your thumb, index, and middle fingers of the right hand (palm facing out) to form a "V" and "U." Notable alumni and affiliates include two Vice Presidents of the United States, 25 Rhodes Scholars, five Nobel Prize laureates, and several Pulitzer Prize and Academy Award winners among others. John D. Arnold, founder of Centaurus Energy. Rosanne Cash, singer and songwriter. William Prentice Cooper—former Governor of Tennessee and Ambassador to Peru. Max Ludwig Henning Delbrück—biophysicist and Nobel laureate. Al Gore, 45th Vice President of the United States, former U.S. Senator, former U.S. Representative, environmental activist. Amy Grant—Contemporary Christian music artist. Marci Hamilton—lawyer, won Boerne v. Flores (1997), Constitutional law scholar. James Clark McReynolds—Associate Justice of the United States Supreme Court. James Patterson—bestselling contemporary writer of thrillers. H. Ross Perot, Jr.—Chairman of Perot Systems, real estate investor. Wendell Rawls, Jr.—journalist, Pulitzer Prize winner. Allen Tate - United States Poet Laureate. Fred Dalton Thompson—former U.S. Senator, actor on NBC's Law & Order television series. Robert Penn Warren—Pulitzer Prize winner, United States Poet Laureate. Jack Watson—Chief of Staff under President Jimmy Carter. Muhammad Yunus—Bangladeshi banker and economist who developed the concept of microcredit. Yunus and Grameen Bank, which he founded, were jointly awarded the Nobel Peace Prize in 2006, "for their efforts to create economic and social development from below." Stanley Cohen—biochemist, discoverer of cellular growth factors, Nobel prize winner (1986). Alain Connes—mathematician, Fields Medal Winner (1982). Elijah Embree Hoss—chair of Ecclesiastical History, Church Polity and Pastoral Theology (1885-1890), later a Bishop of the Methodist Episcopal Church, South. Roy Neel—Campaign Manager for Howard Dean, Deputy Chief of Staff for President Bill Clinton and Chief of Staff for Al Gore. Earl Sutherland—physiologist, discoverer of hormonal second messengers, Nobel Prize winner. ↑ 1.0 1.1 Vanderbilt University, "Mission, Goals and Values." Retrieved February 23, 2009. ↑ 2.0 2.1 2.2 Vanderbilt University, The History of Vanderbilt. Retrieved February 23, 2009. 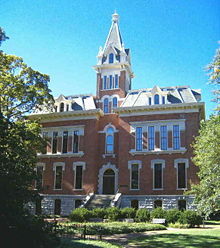 ↑ U.S. News & World Report, "Vanderbilt University,", Best Colleges, 2011. Retrieved January 13, 2011. ↑ Times Higher Education THE World University Rankings 2010 Retrieved January 13, 2011. ↑ Edward J. Renehan, Commodore: The Life of Cornelius Vanderbilt (Basic Books, 2007, ISBN 0465002552). ↑ 6.0 6.1 6.2 Bill Carey, Chancellors, Commodores, & Coeds: A History of Vanderbilt University (Clearbrook Press, 2005, ISBN 097256800X). ↑ Frank Gulley, "Vanderbilt University and Southern Methodism,"Nashville Historical Newsletter, 2006. Retrieved February 23, 2009. ↑ Robert D. Collins, Ernest William Goodpasture: Scientist, Scholar, Gentleman (Hillsboro Press, 2002, ISBN 1577362519). ↑ Jim Patterson, "The Rev James Lawson to return as visiting professor," The Vanderbilt Register, January 30, 2006. Retrieved February 23, 2009. ↑ Tennessee Sports Hall of Fame, "Perry Wallace." Retrieved February 23, 2009. ↑ Vanderbilt University, Joe B. Wyatt 1982-2000. Retrieved February 23, 2009. ↑ 13.0 13.1 13.2 13.3 Matthew Woolsey, Vanderbilt University 2007 (College Prowler, 2006, ISBN 1427402086). 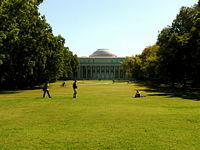 ↑ Vanderbilt University, "Self-Guided Tours." Retrieved February 23, 2009. ↑ Vanderbilt University, "History of the Library". Retrieved February 23, 2009. ↑ Vanderbilt University, "Historic Memorial Gym." Retrieved February 23, 2009. ↑ Vanderbilt University, "Vanderbilt Stadium." Retrieved February 23, 2009. ↑ Vanderbilt University, "RE:VU: Quick Facts about Vanderbilt." Retrieved February 23, 2009. ↑ Kelly Taylor and Sam Patton, Letter: Greer column fails to mention diversity of campus radio station, The Vanderbilt Hustler, April 4, 2007. Retrieved February 23, 2009. ↑ 20.0 20.1 Vanderbilt University, "Traditions and Lore." Retrieved February 23, 2009. ↑ Vanderbilt University, Notable Alumni Retrieved January 13, 2011. ↑ The Norwegian Nobel Committee, "The Nobel Peace Prize for 2006," NobelPrize.org, October 13, 2006. Retrieved February 23, 2009. This page was last modified on 15 January 2016, at 17:29.